Diego is part of our Prehistoric family. Diego loves to roam around the open land. He is the prankster class clown of the bunch. You will see him playing jokes on the others to lighten up life. He is most noticeable by his bright orange spikes that run down his spine. zooby® is truly portable and ready for your family’s journey! Whether you’re running errands, visiting a family’s home, on a road trip, or enjoying a staycation – zooby‘s portability make the traveling options endless. It’s the only baby monitor on the market that has passed a crash test and can be used in many places safely – at home, in the car, and on the go, zooby will provide a peace of mind for parents. WiFi secure and password encrypted connectivity! Free app for your smart device – connects to four devices at one time! Quality built-in speaker and microphone conveniently allows two-way talk with baby! Plays lullabies from the camera! USE AS A MOBILE VIDEO MONITOR via iOS or Android app that you can download for free to your iPhone, iPad, or Android phone or tablet. 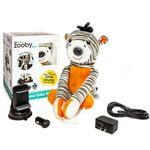 Undoubtedly see what zooby sees, even when your baby is in a rear facing car seat. NIGHT VISION keeps your baby in clear view no matter the time of day or lack of light. Your baby’s safety isn’t left in the pitch dark – you can rest assured that while you’re driving or they’re asleep in their crib, you have them in view in an instant. FULL HD 720 dpi IMAGE with ability to change frame rate of video and screen size (depending on smart device). zooby has a bendable neck for precise view. Virtual pinch zoom allows you to clearly see more of your space and baby’s precious face smiling back at you. *Capture images and recordings to save sweet memories! UP TO 600 FOOT RANGE allows you to observe baby while you’re visiting in the next room, so there’s no disrupting their rest. That’s almost two football fields in length! You can simply connect to (4) smart devices, securely, at one time to allow you the freedom to move from room to room. Go ahead, take that shower you’ve been delaying. TWO-WAY AUDIO lets you communicate with your loved ones with quality built-in speaker and microphone. No messy cords for curious little fingers to get to. 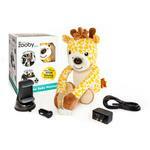 THREE SOOTHING LULLABIES have been preset in your zooby and are ready to play for your little one. No need to disturb baby’s relaxing time, press loop plays and you’ll both enjoy. FOUR CUTE PLUSH DESIGNS to choose from and match your child’s nursery décor and fashion. Styles include: Jordan Giraffe, Diego Dinosaur, Emma Unicorn, and Zachary Zebra. COMES WITH smartphone car mount, car charging adapter, wall charging adapter and 8-foot charging cable. Camera battery icon indicator notifies you when it’s time to charge. Conveniently charge your zooby anywhere you’re visiting! *Feature not available while driving.